To relax after working hard all day, DH and I have resumed a long time habit - he reads aloud while I do handwork. He just finished reading Little Britches by Ralph Moody to me, and I just finished my scarf. I've already written quite a bit about this scarf. You can find the project details here, and details about the fringe, here. What a lovely, clean looking pattern. And I like the beaded fringe. I may have to try that--everything is better with beads! It's lovely! I want to try summer winter sometime! Beautiful color! I agree with Melissa, I love the clean pattern. I used to think I didn't like beads. Now, It think maybe I like them. I like your scarf anyway, so I guess it depends how the beads are used. Wow! All that work on the house and you still have the energy to weave - I am impressed!!! Your scarf looks very elegant and classic and of course I LOVE the beads! I think beads can add just a little bit of shine when needed and they are something you won't find scarf made in an off shore factory! I'm so glad you finished it. Lovely! I am glad you are getting to weaving-related activities with all your house settling in. The scarf is so lovely, I like the the colors and the pattern so much. I am happy that you can manage to find a little time to relax. Beautiful handwork! Your beaded scarf is lovely! Could you suggest a good source for designs/patterns, something online for weaving like knitting has Twist Collective, Knitty, and such? I just listen to audio books. How lucky to have someone to read to you.!!! Happy to hear you're taking some time off. You are so much better at making good use of your time than I am - that scarf is absolutely wonderful. We just had a sprinkle of rain - but the temp is supposed to start going up into the high 80's by mid next week! Snuggles to your fur babies. T.
The scarf is lovely Leigh and I love the beads on the fringe. Gosh, I figured everyone had pretty much given up on checking my blog because I'm rarely here anymore! I listed to audio books too while I work. I have to be careful though, and chose a project that doesn't require too much concentration. I've had to do my share of un-doing because of that! Dorothy, I never thought of myself as a bead person either, but I really like the way this turned out. Janet, I'm delighted you're thinking about weaving again! 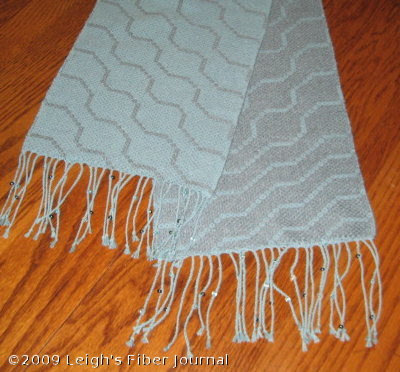 The best online source that I know of is Handweaving.net, but All Fiber Arts has weaving patterns too. You are my hero, Leigh! I have been so very distracted by "summer-stuff" that I haven't finished much of anything this summer. And, as always, this is a beautiful example of why you have a reputation for being a fantastic weaver.